The final holdouts at the sprawling pipeline protest camp south of here were arrested Thursday, and the authorities began using heavy equipment to tear down the remaining structures and destroy tepees on the treaty land where thousands had lived in recent months. 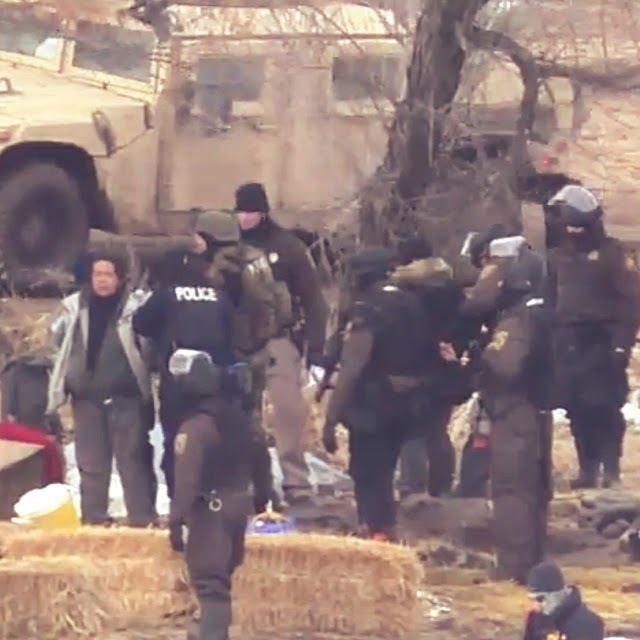 The arrests, of 46 people, came a day after an evacuation deadline issued by Gov. Doug Burgum. 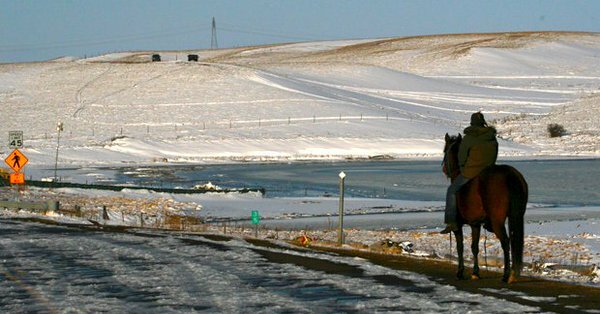 Most protectors left Wednesday of their own volition, and others departed Thursday by crossing the frozen Cannonball River to the Standing Rock Sioux Reservation. 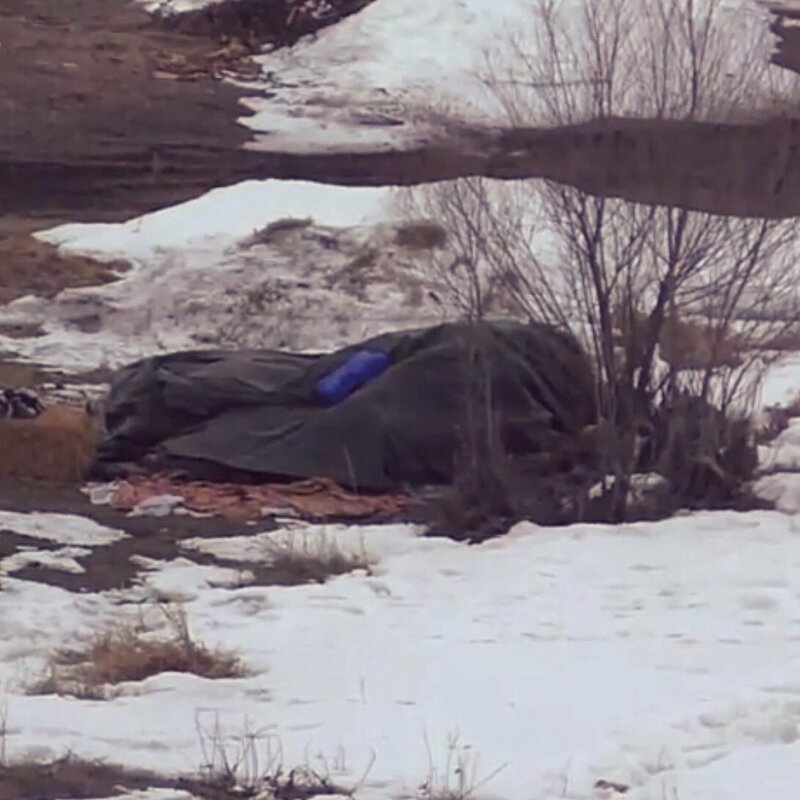 Those who remained at the main campsite were taken into custody. About an hour after the protest camp was cleared, Mr. Burgum signed into law four bills that had been passed largely as a result of the protests. They expand the scope of criminal trespassing laws, make it illegal to cover your face with a mask or hood while committing a crime, and increase the penalties for riot offenses. 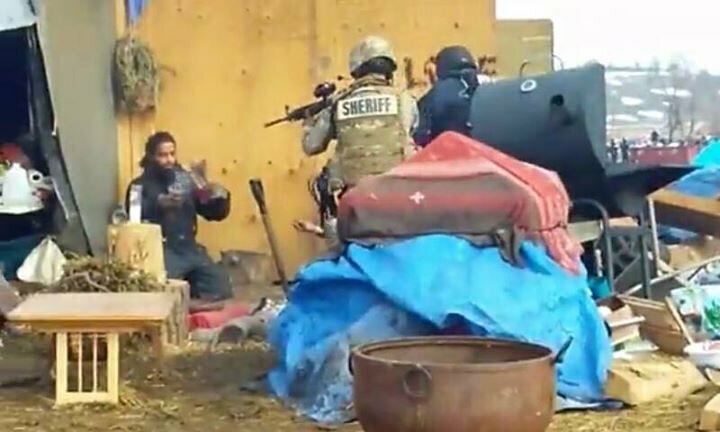 Responses to "Militarized police desecrate sweat lodges, arrest elders in prayer holding up sacred pipe"
Believe it or not, I would say that because of the lack of interest in anything but themselves, Americans have allowed their country to be taken over by the police, mercenaries and the military, and become almost, if not already, a fascist ruled country. 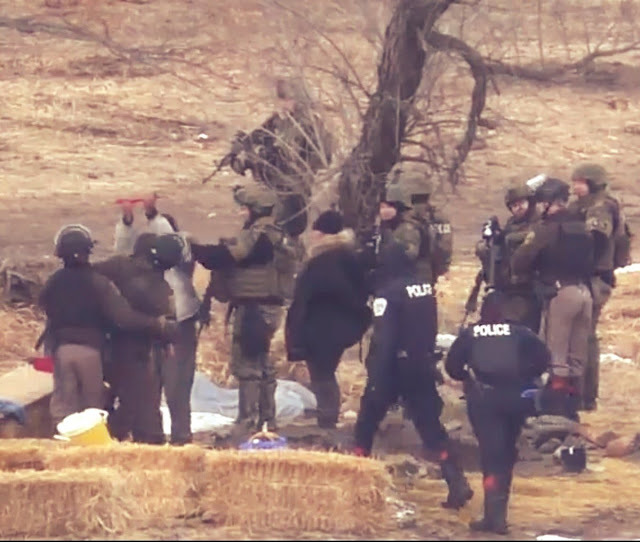 Bless the water-protectors and others who can see where this is all headed! 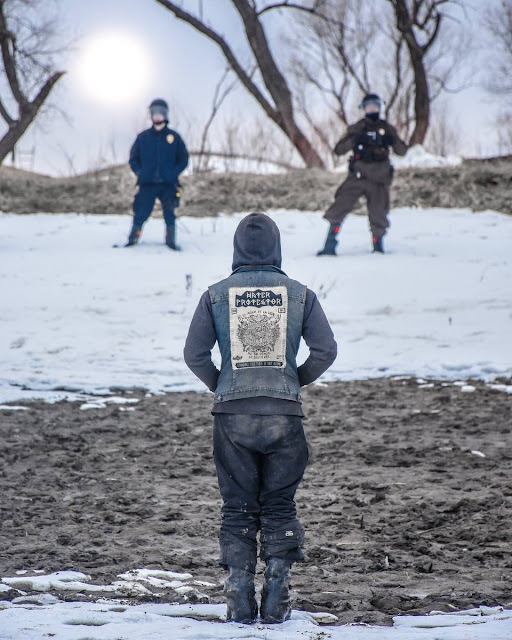 Why be so rough the water protectors were calm and standing in one spot. LOL! Sacred pipe not of much help, huh? Chief Runs With Retardation could not call upon his spirit animal protectors this time around. The animal protectors are there, in the first picture. There will be a return to respect and truth. I am ashamed for my country. 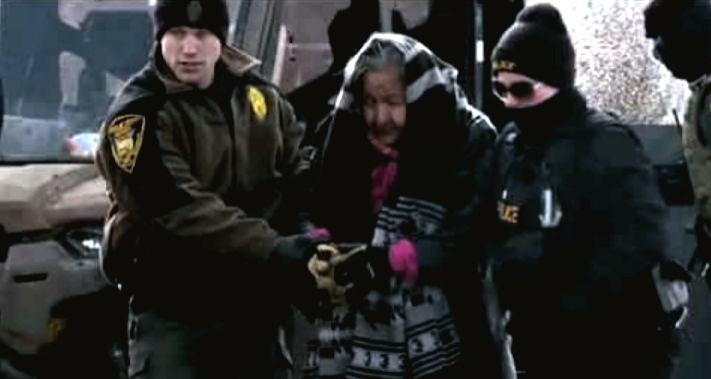 Elders being arrested! How can I say I'm an American with any sense of pride? Thank you to the elders...thank you to all who stayed to demonstrate dignity and freedom. This is a very sad and tragic day. Dear God when will we understand what is more important? I too am ashamed of this country and it's treatment of the Native Americans, and all marginal minorities that we treat like throw away people. It is sickening. Ayukii - Hello, Reading this article and seeing the photos of this makes one's heart break, but at the same time, made one angry. 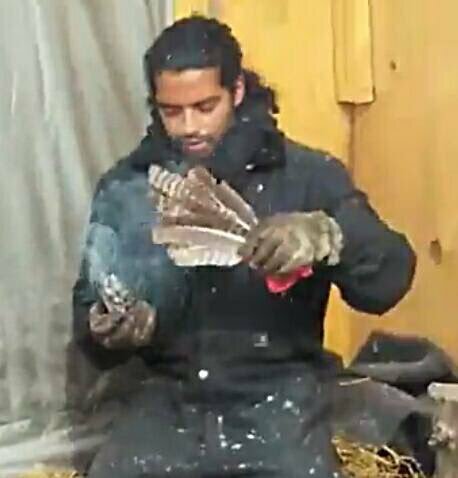 When you can arrest our elders, native vets or any vet, and someone for smudging themselves with sacred medicine on our Tribal sacred lands, something is definitely f.....ked up with this country, but then on the other hand, have they ever treated our Tribal People(s) as Human, HELL NO, not since day one. One day maybe they will listen to us and learn a few things, till then all we can do is pray for their sorry asses, the ones that know of nothing but greed, for them, money is their way of life no matter what the cost, PERIOD. Yootva - Thank you!!! The New Administation has made it's move. Now it's our turn!! !They have gone too far!!! Arresting Elders and Peaceful people and abusing them!!! This must Stop!!! I ask ALL tribes to Unite & Unify!!! Together we are unbeatable, but as a single entity, stand no chance!!! Come Together Now!!! The future of our people ourlands all is at stake yet again!! !I am not just a voice in this, I am a descendant of the late great GERONIMO!!! I ask ALL to Unify Unite Now, Please!!! I'm disgusted beyond belief. 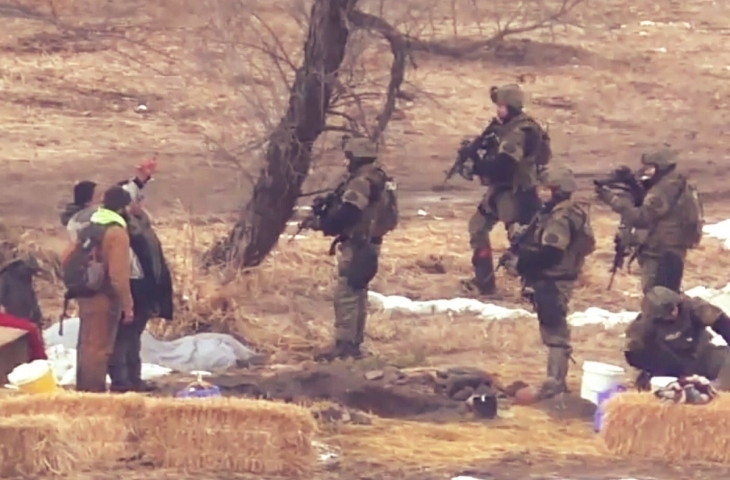 Abuse of power..militarized police force..aggression..lies & deceit from ND Government easily proven by ALL the Live feed video Millions around the World have seen & hopefully downloaded. 100 million Native Americans murdered, Land stolen due to the "doctrine of discovery" & STILL it is NEVER ENOUGH. Their own deceitful, hate filled propaganda will visit them shortly in the Federal Courts. You would think after Hundreds of Years, their mindset would have evolved. But their hearts are dark. I hear "love your neighbor as you love yourself"... Yet its always hate. That speaks volumes. Wake up America. That same police force & All the Constitutional Laws & Articles affect your rights too. Big oil is trying 1 last grab before green energy ALL over the USA, from Canada to Texas. Research this " what does cracked oil do to humans"..then research " what does fluoride do to humans" BE Shocked. Their running pipelines by schools, water sources & housing plats. They don't care. Very Soon Their will be NO CLEAN, CHEMICAL FREE WATER LEFT. Then Water will be as costly as GOLD. Will YOU be able to afford it? If not, you die. STAND FOR THE WATER.